Chocolate. It’s one of the great pleasures of life. One of the best things about it is the fact that it’s suitable for almost any occasion. It is fitting for both celebrations and commiserations, as a little gift or a personal treat. Unfortunately, like a lot of good things in life, it isn’t all that good for us. Packed full of calories with a high fat content and little in the way of actual nutritional value, chocolate very much belongs to the “treat” food group. Health-wise, there’s nothing good about chocolate. Or is there? -Cocoa, which is used to make chocolate, provides phytochemicals. These can improve health by acting as antioxidants. The darker the chocolate, the higher the phytochemical content. -Eating chocolate can trigger a release of serotonin within the brain, which contributes to the pleasurable experience. Some people argue that this can cause people to feel "addicted" to chocolate and women to crave chocolate before their menstrual cycle begins. -Chocolate provides some vitamins and minerals, like magnesium, that the body needs. -Chocolate contains sugar, although the exact amount will vary depending on how the chocolate is prepared and processed. Sugar is a carbohydrate, which the body needs for quick energy and proper brain function. However, excessive intake of sugar can adversely affect health so moderation is important when enjoying chocolate. -Chocolate is relatively high in fat. However, the dietary fat in chocolate is called "stearic acid," which does not affect blood lipids as much as some other types of fat. -Cacao, the source of chocolate, contains antibacterial agents that fight tooth decay. However, chocolate with a high sugar content will negate this benefit. Dark chocolate contains significantly higher amounts of cacao and lower amounts of sugar than white chocolate, making it more healthful. -The smell of chocolate may increase theta brain waves, resulting in relaxation. -Chocolate contains phenyl ethylamine, a mild mood elevator. -The cocoa butter in chocolate contains oleic acid, a mono-unsaturated fat which can raise good cholesterol. -Men who eat chocolate regularly live on average one year longer than those who don’t. -The flavanoids in chocolate help keep blood vessels elastic. -Chocolate increases antioxidant levels in the blood. -The carbohydrates in chocolate raise serotonin levels in the brain, resulting in a sense of well-being. 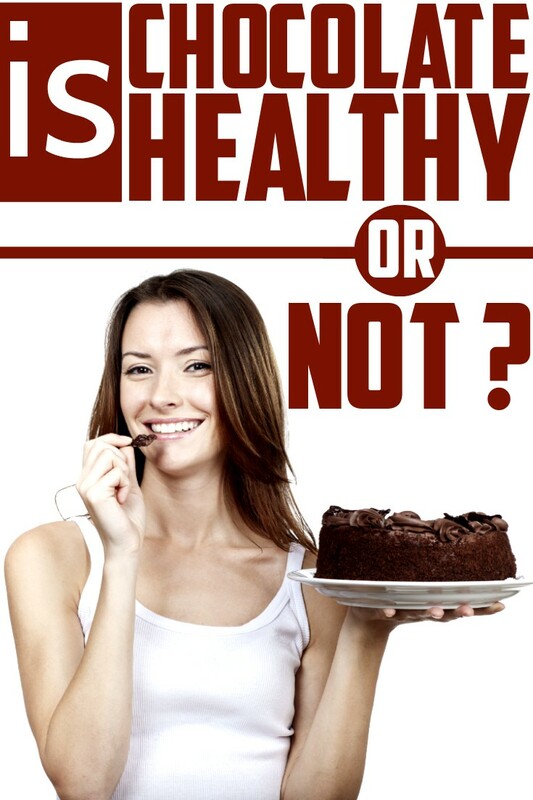 -Chocolate may contribute to lower bone density. -Chocolate can trigger headaches in migraine sufferers. -Milk chocolate is high in calories, saturated fat and sugar. -Chocolate is a danger to pets (chocolate contains a stimulant called theobromine, which animals are unable to digest). Do: Choose dark chocolate that is at least 70 percent cacao to get enough flavonoids to make a difference. Don't: Go for any milk chocolate bar off the shelf, which is not only lacking in polyphenol power, but is also probably loaded with added sugar and milk. If those are the first two ingredients on the label, move along. Do: Limit yourself to about an ounce of chocolate a day in the afternoon or as a mini-dessert after dinner. Do: Enjoy yourself! A little bit of chocolate every day for better heart health, skin and less stress is a win-win-win-win.